Earlier this week Sam decided to resume playing soccer. I think she was a little burned out after the intensity of the past year in preparing and participating in the international tournament this past July. So after coming back from Israel she took a well deserved break, but that stretched out over the remainder of the summer as she worked as a Camp counselor and bus monitor as her summer job and thus had little free time to spare. It wasn’t until late September that she laced up her boots for her Varsity soccer team and began playing again, and two weeks ago she went with her team as participated in a Canadian High school tournament in New Brunswick. After the tournament it was clear that she had missed playing competitively and I noticed her enthusiasm coming back. Although unsure if she wanted to go back to the Academy that’s she been with for the past three years, but after contacting them they were keen to have her return. Your teenage years are difficult enough with all the changes that you’re going through plus the social pressures so i think she was feeling a little overwhelmed with it all, and not truly feeling like she had a social life with her friends then the added pressure of playing top level soccer and her studies…well, its a lot to ask of a 16 year old. My guidance to Sam has always been and will continue to be “as long as you’re having fun, go out and enjoy it”. Although deep down I think she was worried that she’d be disappointing me if she stopped playing. Definitely not the case and have always been supportive of whatever decision she decided on. Clearly, it would seem that as humans we’re completely delusional! 🙂 Or maybe that’s just me??? Hey, that’s your outside voice…be nice! Early in my Australian rules football career I remember sitting exhausted in the change room one day after a particularly tough match when an older teammate leaned in and said “son, you never know when it’s going to be your last game so you have to play everyone as though it’s your last”. Truer words have never been spoken and as I’ve gotten older I’ve begun to appreciate his words of wisdom more than ever. In what was to become the final game of my football career I broke my thumb quite badly and had to leave the field, little did I know that that game would be the last I’d play. Perhaps I just needed a little sign that enough was enough…as my body had been much slower to heal and respond to the constant strain and impact that each season brought. None of us have any idea as to the last time we’ll do something, or see someone and often don’t give it another thought but before you know it weeks, months or even years have passed and that thing you loved most (person, place or thing) is no longer in your life. What then? As I’ve said before often the littlest, most inconsequential things or decisions in life often lead to the most life altering changes…even though we don’t recognize it at the time. That’s how life is I suppose…the good with the bad. How do you think you’d act if you knew this would be the very last time you did something or saw that special person in your life? What would you do differently? 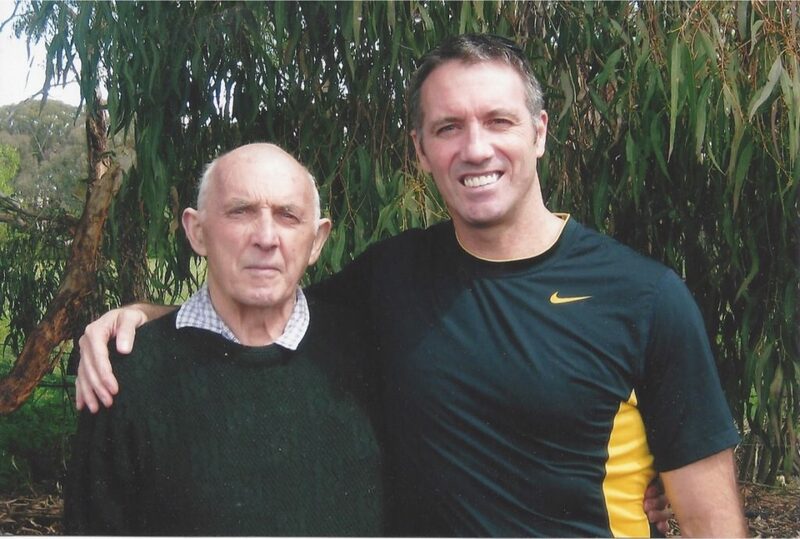 I remember the last time I was with my dad, I’d wheeled him out of his hospital room at the little country hospital where he had been admitted a few days before. It was a beautiful sunny Feburary morning, (remember its Australia so still summer there), and not yet too hot. The dew was still evident on the grass and you could hear the magpies warbling from the nearby eucalyptus trees. We both sat in silence, enjoying the morning sun warming us. We chatted briefly, but we were both preoccupied as I was headed to the airport after leaving him to begin my trip back to Canada for a week and he was mired in deep thought. We said our farewells and my parting words were “I’ll see you next week dad. I love you”. He just smiled but I could see that he had tears in his eyes. So maybe this weekend, you’ll hold the ones you love just a little closer, or spend a little more time doing the things that you truly love. 2 Comments on "Last time…"
Lovely words and something I know I am aware of a lot these days. Time is such a scarce commodity and so important to spend it wisely. Totally agree Gavin - I hope you and your family are well and enjoying life. All the best mate!